Graeme Nixon completed his postgraduate degree on intracellular signalling of vascular smooth muscle cells in experimental hypertension from the Department of Medicine and Therapeutics, University of Glasgow. This was followed by a 4 year American Heart Association postdoctoral fellowship in the Department of Molecular Physiology and Biological Physics, University of Virginia investigating intracellular signalling pathways regulating smooth muscle contractility. 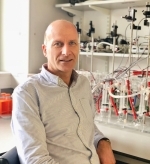 He was subsequently appointed Lecturer in Physiology at the University of Aberdeen and now holds a Personal Chair in the School of Medicine, Medical Sciences and Nutrition. He is also the Dean of Postgraduate Research, a university-wide role with strategic oversight of the PhD student journey. Professor Nixon established, and is the co-director of, the Aberdeen Cardiovascular & Diabetes Centre. It consists of approximately 30 senior laboratory scientists and clinicians from the University of Aberdeen and NHS Grampian working together to improve patient outcomes through research and education in cardiovascular diseases and diabetes. 1) Ca2+-regulated processes which change blood vessel function and may lead to the development of cardiovascular disease. 1) Ca2+ regulated processes which change blood vessel function. The importance of regulating the levels of intracellular Ca2+ for many different cell functions is now widely appreciated. In vascular smooth muscle an increase in the intracellular Ca2+ concentration is known to tightly regulate contractility, thereby controlling blood pressure. However, more recently, studies have demonstrated that Ca2+ also has an important role in regulating vascular smooth muscle cell phenotype and could be involved in the development of cardiovascular disease. My laboratory has investigated the question of how Ca2+ is regulated in different vascular smooth muscle phenotypes and examines the effect that this difference in regulation has. Our early studies examined the expression of the intracellular Ca2+ release channels, the inositol 1,4,5-trisphosphate receptors (Tasker et al, 1999; Tasker et al 2000). More recent research has focused on the important role of Ca2+ regulating enzymes involved in activating gene expression leading to cardiovascular disease. Our studies have shown how changes in Ca2+ homeostasis may contribute to the development of cardiovascular disease in diabetes (David et al, 2008). Our laboratory has also examined enzymes closely associated with proliferation in blood vessels, the mitogen-activated protein kinases called extracellular signal-regulated kinase (ERK)1/2. Our recent clinical trial demonstrates the importance of ERK1/2 as a marker of cardiovascular disease in patients (Wilson et al, 2009). We have further shown how ERK1/2 is regulated by Ca2+ and in turn how this affects vascular smooth muscle cell function (Egan & Nixon, 2004; Egan et al, 2005). We believe this regulation is important in the development of vascular injury during the development of vascular disease (Egan et al, 2005). Most recently, we have uncovered a new pathway in vascular smooth muscle cells which acts as an essential link between intracellular Ca2+ and proliferation. This involves a Ca2+-activated protein previously uncharacterized in the cardiovascular system, phosphoprotein enriched in astrocytes-15 (PEA-15). Our recent study (Hunter et al, 2011) has now revealed that PEA-15 regulates gene expression and the function of vascular smooth muscle cells by interacting with ERK1/2. The essential function of PEA-15 in blood vessels is to regulate ERK1/2 localization to the cytoplasm or the nucleus (see figure below). A translocation of ERK1/2 to the nucleus is required for growth factor-induced gene expression and ultimately proliferation. Research is now continuing to demonstrate the role of PEA-15 in cardiovascular disease using human blood vessels (see image below). 2) The physiological and pathological functions of sphingolipids in blood vessels. In recent years the research of several labs (including my own) have highlighted the importance of sphingolipids in blood vessel function and the potential role that these lipids may play in the development of vascular disease. In particular two of these sphingolipids, sphingosine 1-phosphate (S1P) and sphingosylphosphorylcholine (SPC) have profound effects on vascular smooth muscle cells. Part of the rationale for examining these effects comes from studies on platelets involved in blood clotting (an event often correlated with the onset of vascular disease). Platelets synthesise, store and release high concentrations of S1P and also release SPC. Sphingolipids are also important components of lipoproteins and plasma levels of sphingolipids are regulated by erythrocytes (reviewed in Nixon et al, 2008). These naturally occurring lipids are therefore relevant in cardiovascular physiology and pathology. Initial studies in my laboratory were the first to show that S1P receptors are expressed in native vascular smooth muscle and can regulate blood vessel contraction. In particular we have demonstrated that cerebral blood vessels, which supply blood to the brain, were more sensitive to S1P due to the higher expression level of S1P receptor subtypes (Coussin et al, 2002). This may have important implications for cerebrovascular disorders such as stroke. Further studies have examined the intracellular pathways activated by S1P and SPC which may relate to the pathogenesis of vascular disease in cerebral blood vessels (Coussin et al, 2003; Mathieson & Nixon, 2006; Wirrig et al, 2011). An example of S1P effects on the intracellular calcium regulation is shown below (see figure). Recent research is also examining the effects of sphingolipids in the growth of new blood vessels. This process is called angiogenesis. Following a heart attack (myocardial infarction), blockage of the coronary blood vessels in the heart can stimulate angiogenesis. This is beneficial as it will provide new blood vessels to perfuse areas of the heart with limited blood supply caused by the blockage. As platelet activation has an important role in myocardial infarction, sphingolipids will be released at the site of the blockage. Our research with human arteries now demonstrates that in an ex vivo model of angiogenesis, S1P can inhibit the growth of new vessels (see image below). This would be detrimental following myocardial infarction and therefore therapeutic agents designed to inhibit S1P may be of benefit in this case. We have also developed a model of "human coronary arteries in a dish". This model uses the cell types that normally constitute a human coronary artery in the heart. By combining these cell types and treating with specific growth factors, we can induce development of a coronary artery blood vessel networks. Using this novel approach, we have shown that S1P also blocks the growth of new coronary arteries by preventing tubule formation of the endothelial cells (see image below). Our recent paper (Mascall et al, 2012) details the mechanisms of this inhibitory effect. Current research is also exmamining the effects of sphingolipids on aortic valves in the heart. The micronutrient zinc is critical to many physiological processes in vivo and has an essential role in health. Dietary zinc deficiency, which occurs due to inadequate intake, decreased absorption or increased loss can therefore be an important factor in many pathological conditions. This is particularly relevant in the elderly where zinc utilization and absorption are known to be decreased with age. Recently, evidence has emerged suggesting that zinc deficiency is associated with the development of cardiovascular diseases such as atherosclerosis. The cell types and intracellular mechanisms involved in these zinc-dependent atherogenic changes are not known and could be due to effects on vascular smooth muscle cells. Our recent research has now indicated that dietary zinc deficiency results in programmed cell death (apoptosis) in the vascular smooth muscle cells. This includes depolarized mitochondria, a hallmark of the apoptotic process (see image below). Apoptosis has a role in the clincal problems associated wiht atherosclerosis. This research indicates that those with lower zinc intake (such as the elderly) may exacerbate underlying atherosclerosis. Further experiments will continue to determine the relationship between cardiovascular disease and zinc deficiency. Teaching across level 1-4 at undergraduate and at level 5 (MSc).